Volume One of THE OUTLANDISH COMPANION (aka "OC") is a non-fiction book, supplying information, background, entertaining trivia and the answers to the many questions that readers asked me about the first four novels in my OUTLANDER series of books. It was first published in the U.S.A. in March, 2015. Volume One of the OC is an updated and revised version of the original, single-volume OUTLANDISH COMPANION, first published in 1999. By 2015, there were four more novels in the main OUTLANDER series (and quite a few other related books, to boot), so a second volume of the OC was added, a project which took several years. What Does The Revised OC Contain? 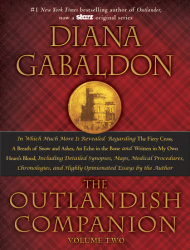 How is the new OUTLANDISH COMPANION different from the original edition? To start with, there were two whole chapters (and a number of smaller items scattered here and there) of the original COMPANION that had become completely obsolete: the chapter about On-Line Communities and Resources (the internet has changed a lot since 1998 and most of the sites described no longer exist), and the chapter about "Work in Progress," which included several long excerpts from THE FIERY CROSS. Since that book’s been out for quite a long time, obviously those are no longer relevant. Scattered items through the book are outdated, such as a question in the FAQ section about whether OUTLANDER might ever become a movie and what I thought of the possibility. So I pulled all that stuff out, and replaced-rewrote the smaller items, mostly with fresh questions from various interviews done over the last few years. "The Shape of Things," an essay on How I Write, and what the internal geometry of each book looks like to me. The new TV section has several pieces, describing the book-to-screen process (how we got from an option to the Starz Outlander TV show), the adaptation process in theory and in practice, the actors and what they do, and an account of "My Brief Career as a TV Actor." Also added is a section (including photos) from the show, kindly supplied by Sony. And much more! A publisher’s description of Volume One of the revised OC is also included below. THE OUTLANDISH COMPANION (VOLUME TWO), contains background and lots of information about my books from THE FIERY CROSS (fifth book in my OUTLANDER series of novels) to WRITTEN IN MY OWN HEART’S BLOOD (the eighth book in my OUTLANDER series), plus a number of other Interesting Items. It was released on October 27, 2015 in the U.S.A.
Click here for more information on Volume Two. Number-one New York Times bestselling author Diana Gabaldon has captivated millions of readers with her critically acclaimed OUTLANDER novels, the inspiration for the STARZ original cable series. From the moment Claire Randall stepped through a standing stone circle and was thrown back in time to the year 1743—and into a world that threatens life, limb, loyalty, heart, soul, and everything else Claire has—readers have been hungry to know everything about this world and its inhabitants, particularly a Scottish soldier named Jamie Fraser. 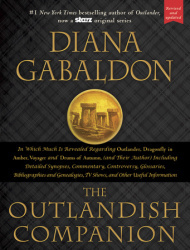 Note that the 1999 edition of THE OUTLANDISH COMPANION in the United Kingdom was titled THROUGH THE STONES. If you don’t live in the U.S., please click here for general information about publication of my books in other countries and languages. This page was last updated on Saturday, January 13, 2018 at 12:40 a.m. (PT) by Diana’s Webmistress.